For the best taco, follow directions to heat up prepackaged taco shells. Heat them in the oven if you want crisp shells to hold your ingredients. Use the microwave -- which is quicker and more energy-efficient -- if you like the shells to be more pliable. These will be less likely to break when you take your first bite of meat, beans, cheese, lettuce or other fillings. Dampen a paper towel with a spray bottle or under running water. Line a microwave-safe plate with the dampened paper towel. Lay a single layer of taco shells on the microwave-safe plate. 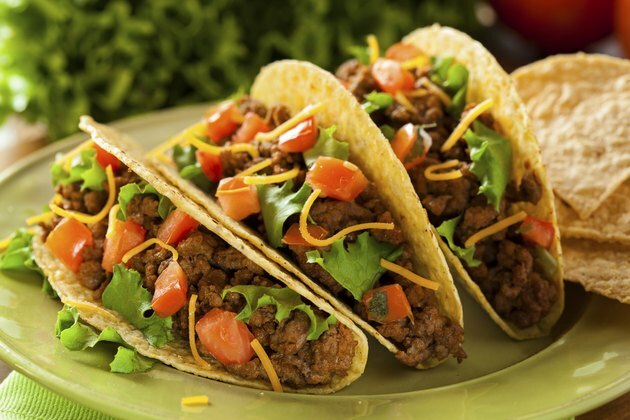 An average-sized plate should hold about six tacos without them overlapping. Heat the shells for 30 seconds on high heat in the microwave. The steam created from the wet paper towel makes the shells more flexible and less likely to crack after adding beef, chicken, pork or other fillings. For a single-serving, place one taco shell in a dampened coffee filter on a microwave-safe plate. Cook on high heat for 20 seconds. The coffee filter serves as a holder for the taco shell. Tacos are delicious, but watch your servings. One taco shell can run anywhere from 120 to 150 calories, and this doesn’t include the taco fillings or toppings.